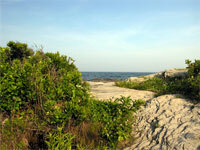 Long Island is Maine's newest Town having seceded from the City of Portland on July 1, 1993. The 180 or so year-round residents felt they were better able to determine how their tax monies should be spent than could the City Councilors in Portland. This action reflects the strong & independent nature of those living on this 900 acre Island. Fishing is the primary occupation of Long Islanders with a variety of other self employed people rounding out the work force. Some do commute into Portland every day. There is a store on the island, a seasonal restaurant, elementary school and a couple of churches. There is an abundance of undeveloped woods and there are two of the nicest white sandy beaches, open to the public, anywhere in the Casco Bay Region - Islands or mainland. They are, however, seldom crowded simply because many are unaware of their existance. Up to eight ferries a day (fewer in the winter) make the 40 minute or so trip from downtown Portland so quick trips into Portland for a movie, shopping or just a taste of City life is easily done before retreating back to the quiet & beauty of this Maine Coast Island - all without ever having to get into a car!